Mizuno Judo Suits UK and Ireland. 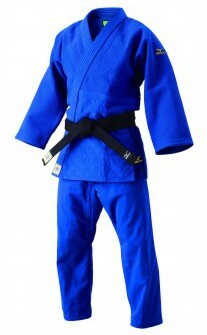 IJF Approved suppliers of Judo Suits and Belts. No orders will be dispatched unitl Monday 29th April. Apologies for any inconvenience. Blue, Double Weave, 750gsm, 80% cotton, 20% polyester. Competition Judogi approved by the International Judo Federation. Shrinkage: with the poly/cotton blend you can expect minimal shrinkage on the jacket, around 1 inch on the length and each sleeve. The trousers will shrink a standard amount of up to 2 inches, depending on the washing conditions (please note that the gis are made larger to accommodate this shrinkage).